The Happy Homebodies: Nice Rack! I bought a new rack this weekend. No, not that kind of rack. I was struck by its industrial awesomeness and simply had to have it! Now it has a new home in my art studio/craft room/office nook. In case you're wondering, I found it at Marshall's. I knew I had been saving all of those Dominos for a reason! Now I have the perfect place to display them. If you have really astute observational skills, you may notice there is a different lamp in each picture. I was trying out each one and eventually settled on the one in the first picture. That second lamp was part of a mod-podging spree I went on over a year ago. I'm sorry these photos aren't the greatest, but things have been super busy around these parts. I only had time to snap a quick iPhone photo. My favorite part of the new wire magazine rack is that it perfectly complements our new industrial shelf in the dining room. You see both walls as soon as you walk in the front door, and now I feel like they tie in really well together. I have seen these racks popping up all over at Marshall's, TJ Maxx and HomeGoods. Get them while they're hot! I accidentally dropped a small can of paint in this studio, which proceeded to splatter all over the rug. 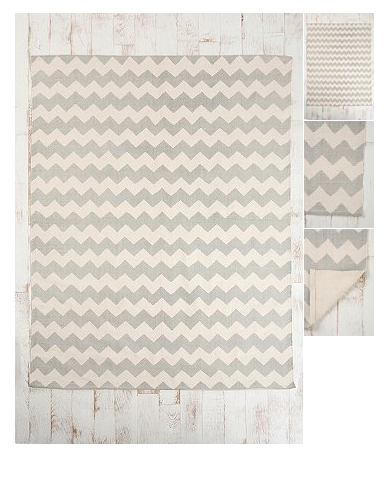 I have ordered this rug from Urban Outfitters to replace it and can't wait to see how it looks!